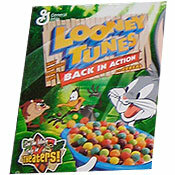 The complete name of this cereal was Loony Tunes Back In Action - The Cereal. 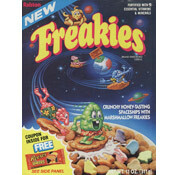 It consisted of "fruity sweetened corn puffs." 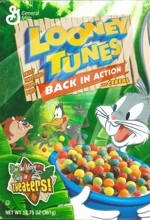 This cereal was a promotional tie-in for the film "Loony Tunes: Back In Action" from 2003. What do you think of Looney Tunes Back in Action?